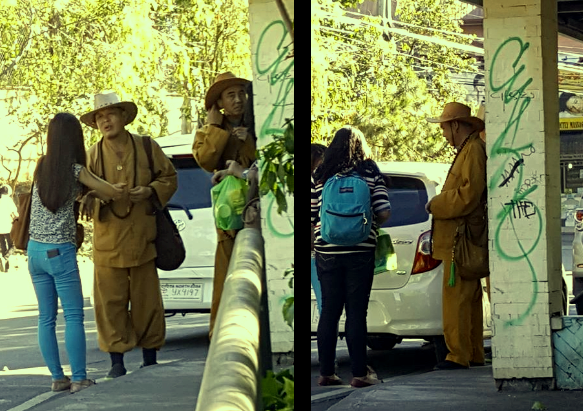 Beware of these men dressed up as Buddhist monks roaming the streets of Baguio City. They've been spotted in Session Road, in Leonard Wood, in Harrison Road, and other major streets in the city. Their alleged modus operandi is to put a bracelet in your hand or hang beads or a necklace on your neck and then suddenly ask for money ranging from 100 to 500 pesos. They can be aggressive in insisting that you pay them. They often don't accept amounts below these. This is a scam, pure and simple. If these men are genuine devotees of Buddhism, they should be spreading the belief system's teachings, not trying to siphon away money from people. A lot of the people they approach are young people (mostly students) because they are easier to manipulate. In short, please stay away from these robed men. They are even seen wearing cowboy hats to sort of take advantage of the prevailing culture here in the Cordilleras. Stay away from these men. If you see them, move aside. Don't let them put a bracelet on your hand or beads on your neck. If they insist, just remove the bracelet or necklace and return it to them. If they become aggressive, call the police. To the Baguio City police, please do something about this. Many people, especially unsuspecting students have fallen for their traps. To those who have fallen to these men's modus operandi, please feel free to tell your stories below to raise more awareness.